It looks as if the first nine pages were written in one sitting. 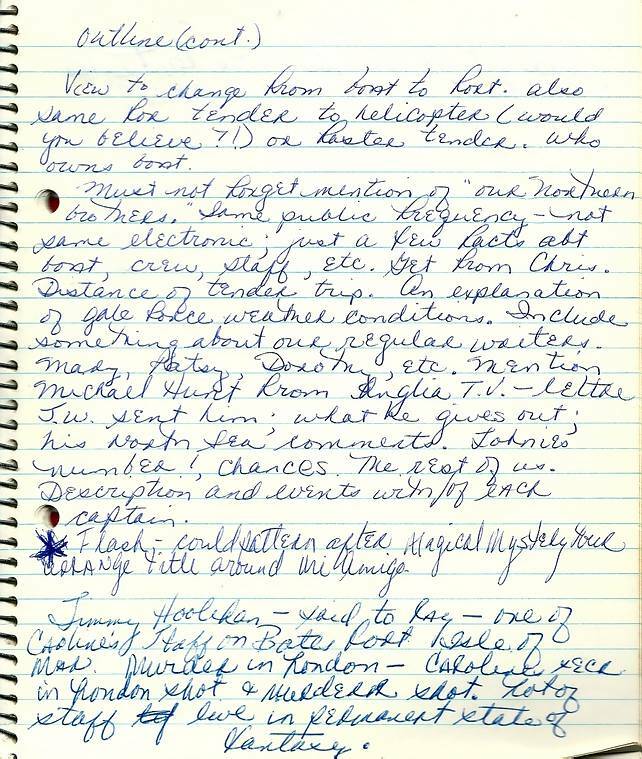 Halfway down this page, the writing changes and a different pen is being used, as if Carl is adding some later thoughts. There is an interesting comment at the top. Were there plans to transfer Radio Caroline South to a Thames fort in 1968? Michael Hunt, who gets a mention, was the Anglia Television weatherman for many years. Jimmy Hoolihan was an associate of Ronan O'Rahilly's. It is unknown what incident the line at the bottom of the page about a shooting is referring to. Can anyone provide more information? View to change from boat to fort. Also same for tender to helicopter (would you believe?!) or faster tender. Who owns boat? Must not forget mention of “our northern brothers”. Same public frequency - not same electronic; just a few facts about boat, crew, staff, etc. Get from Chris. Distance of tender trip. An explanation of gale force weather conditions. Include something about our regular writers - Mary, Patsy, Dorothy, etc. Mention Michael Hunt from Anglia TV - letter JW sent him; what he gives out; his North Sea comments. Johnnie's number! Chances. The rest of us. Description and events with/of each captain. * Flash - could pattern after Magical Mystery Tour, arrange title around the Mi Amigo. Jimmy Hoolihan - said to Ray - one of Caroline's staff on Bates fort. Isle Of Man. Murder in London - Caroline secretary (? or is that word exec?) in London shot & murderer shot. Lots of staff living in permanent state of fantasy. 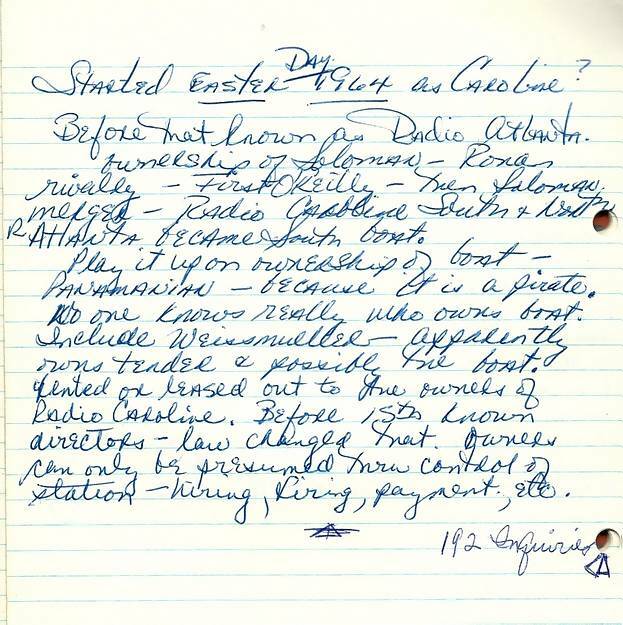 Page ten is Carl's brief summary of Radio Caroline's history. He joined the station three and a half years after it began and is obviously a bit unclear on the precise details, getting the facts wrong, confusing Allan Crawford with Philip Solomon, and spelling names, including that of the station founder, incorrectly. Started Easter Day 1964 as Caroline? Before that known as Radio Atlanta. Ownership of Soloman (sic) - Ronan rivalry - First O'Reilly (sic) - then Soloman (sic) merger - Radio Caroline South & North. Radio Atlanta became South boat. Play it up on ownership of boat - Panamanian - because it is a pirate. No one really knows who owns boat. Include Weismuller (sic) - apparently runs tender and possibly the boat. Rented or leased out to the owners of Radio Caroline. Before 15th known directors - law changed that. Owners can only be presumed through control of station - hiring, firing, payment, etc. The final page contains Carl's ideas for the future. In fact he didn't move to Nova Scotia, Andorra or the Antilles - he stayed in Amsterdam after the closure of Radio Caroline and joined Radio Northsea International when it launched two years later. 1) Look to possibilities of getting money for Caroline story. 2) Get £10 from George. 4) If all blows in England, see about Dublin. 5) Nothing there, see about Nova Scotia or Radio Antilles. M.B Watson. Radio Andorra (Matilda). 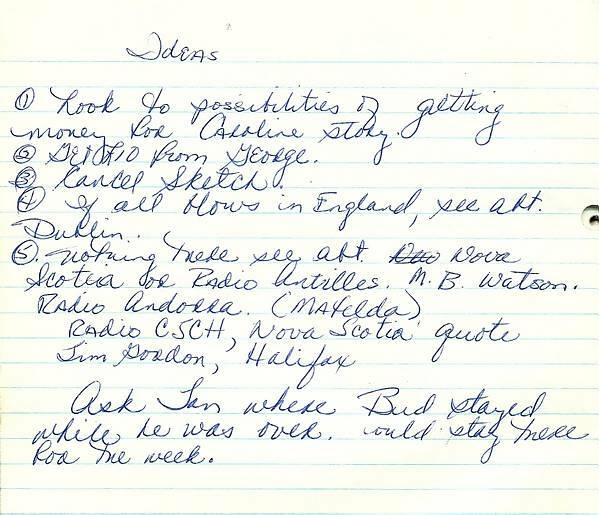 Radio CSCH, Nova Scotia quote Jim Gordon, Halifax. Ask Jan where Bud stayed while he was over. Could stay there for the week. On to the next page of Carl's memorabilia. With many thanks to Andy Archer and Bud Ballou for their help.